Metro Ports is a subsidiary of Nautilus International Holding Corp. (Nautilus), a privately held stevedore and terminal operating company with headquarters in Long Beach, California, writes Metro Ports Chief Operating Officer Michael Giove. Metro Ports can trace its roots to the California gold rush when the company was founded as California Stevedore and Ballast Co. in 1852. The development of the ports of Los Angles and Long Beach led to the formation of a second company in 1923, Metropolitan Stevedore Company – Metro Ports as it is known today. The company has been in continuous operation in the maritime industry for the past 166 years. locations for handling these fertilizers include Wilmington, N.C.; Morehead City, N.C.; Galveston, Texas; Burns Harbor, Indiana; Stockton, Calif.; and Long Beach, Calif. In most instances, dry bulk fertilizers are unloaded from vessels or river barges, using conventional type clamshell buckets where the fertilizer cargoes are discharged into shoreside hoppers and conveyed or trucked into flat storage warehouses. Most of these storage facilities are leased from public port authorities and retrofitted to meet the various demands of fertilizer producers and traders so as to avoid contamination and moisture, as well as provide separation between various grades. 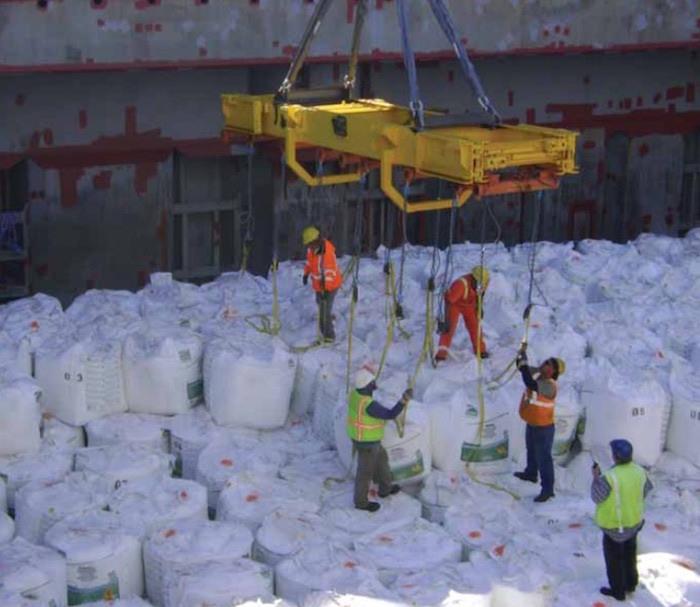 Imported bagged products are normally discharged using highly automated spreader bars to achieve maximum production. Besides vessel and barge stevedoring activities, Metro Ports also provides many value-added services, such as blending, screening, conditioning, bagging, and palletizing, in its warehouse facilities before products are either delivered to trucks or railcars. Unlike other dry commodities, fertilizer commodities can present their own set of unique handling and market challenges. Because of the corrosive nature of these products, proper maintenance and care of mobile equipment that is regularly exposed to these conditions is critical to maintaining the efficiency and operating life of this equipment. Metro Ports has partnered with most of the major fertilizer producers and traders during a number of years by developing a deep understanding of the end-clients’ needs and challenges, whether it be the effects of climate change, seasonal demand by growers, or simply the economic impact of fertilizer prices impacted of global supply and demand in the market. To that end, Metro Ports has entered into long-term contracts that provide for the agility to take these external circumstances into account, therefore a true partnership.